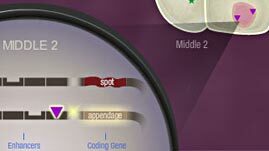 This interactive activity from NOVA examines how mutations in different regions of an organism's DNA affect gene expression—whether genes are turned on or off during the organism's development. An animated model depicts two DNA segments in the nucleus of a fertilized egg. Each segment contains a coding gene, enhancers in the noncoding regulatory region, and other DNA not associated with the gene. As the egg develops, each cell produces its own proteins. Whether and where these proteins bind to the DNA determines gene expression. Mutations can change how receptors in each of the regions permit or prevent such binding. This, in turn, influences which traits are displayed. This media asset is from NOVA Teachers. Typically, when we think of genetic mutations, we think of DNA-copying errors during cell division, or perhaps the impact of environmental factors. But it turns out that mutations in regulatory mechanisms—not just in genetic code—can also explain how species come to exhibit new traits. When a cell divides, it makes a copy of its DNA instructions for the new cell. The double helix structure unwinds and the strands separate. The nucleotides (adenine, thymine, guanine, and cytosine) on each strand pair up with free nucleotides in the nucleus, creating two new strands. Every time a cell divides, it must copy about 6,000 million letters of DNA code. Sometimes errors, or mutations, occur so that a single nucleotide base is changed or entire sequences of DNA are accidentally deleted. Mutations can also be caused by environmental agents, including UV rays in sunlight, cigarette smoke, and radiation, which can alter bases so they look like other bases or break the phosphate "backbone" of DNA. Our cells have built-in mechanisms that catch and repair most mutations that occur during replication or from environmental damage. But some mutations inevitably get through and result in new traits being passed on to offspring. Scientists have recently discovered that regions of DNA once believed to have no particular function can contain molecular mechanisms responsible for regulating gene expression. These mechanisms, called gene switches, determine whether certain traits are expressed as an organism develops. Thus, depending on whether a gene is switched on or left off, a single gene can produce very different traits in a species. When a mutation occurs in a noncoding region and a gene switch is added or deleted, new traits can result. Provided the new traits are not fatal, they may be passed on to offspring and eventually result in new species being formed. For example, as the interactive activity demonstrates, a creature may display or lack specific structures, such as spots on its body or appendages at different locations. A gene switch mutation explains why some people have blue eyes. Up until about 6,000 to 10,000 years ago, all humans had brown eyes. Then, a mutation in the gene involved in the production of melanin—the pigment that gives eyes their color—resulted in a switch present in some people's genes that controls how much melanin is produced in the iris. This switch does not turn melanin production on or off; rather, it limits how much is produced. Thus, it effectively dilutes brown eyes to blue. To learn more about gene switches, check out Switching Genes On and Off. To learn more about how genetic information is copied, check out The Nuts and Bolts of DNA Replication and How DNA Replicates. To learn more about diseases caused by gene mutations, check out A Mutation Story, How Cancer Grows, and One Wrong Letter. What is the difference between the coding and noncoding regions of a gene? What are mutations, and how do they occur in a cell? 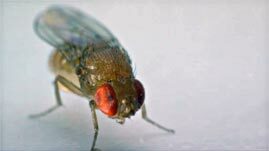 How can gene switch mutations lead to the evolution of a species?